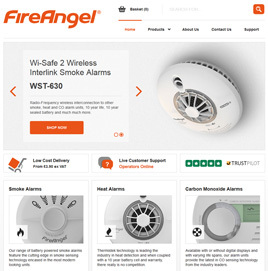 Safelincs has launched a website dedicated to the sale of FireAngel fire and carbon monoxide detection products; this follows the signing of a two year contract between Safelincs and Sprue Safety Products, the company behind FireAngel, in July 2015. Sprue and their FireAngel alarms have long been on the forefront of design and technology, a fact which is recognised by a large number of fire services which install and recommend FireAngel products. Included in the range is a selection of high tech smoke alarms, applying technologies such as Thermoptek and Thermistek fire detection, which cut down the number of false alarms from smoke and heat detectors. FireAngel also offers a large number of carbon monoxide detectors, including sealed ten year CO alarms, offering total peace of mind. As part of the contract Safelincs will also promote and sell First Alert, BRK and FireEye smoke and CO alarms, all part of Sprue’s significant alarm portfolio.